On October 11, 2015, Iran launched a medium-range ballistic missile “Emad”, inherently capable of delivering a nuclear weapon, which was immediately duped by United States as a clear violation of U.N. Security Council Resolution 1929, which was adopted in 2010 and remains valid until a nuclear deal between Tehran and six world powers goes into effect. Under that deal, reached on July 14, most sanctions on Iran will be lifted in exchange for curbs on its nuclear program. The missile test is not a violation of the nuclear deal, which focuses on Iran's atomic program, U.S. officials have said. Speaking to reporters in Washington, President Barack Obama acknowledged that the nuclear deal does not fully resolve all areas of dispute with Tehran. 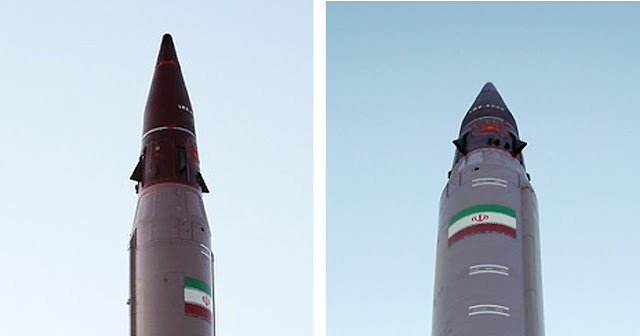 Image Attribute: Two views of the new MARV employed on the EMAD Ballistic Missile. Any missile capable of carrying a large conventional payload—including the Emad—is technically capable of carrying a nuclear warhead. But the deal’s prohibition “doesn't lie in missile booster or nonnuclear warhead design, or range-payload,” said Anthony Cordesman, an expert on Iranian missile capabilities at the Center for Strategic and International Studies in Washington. “It only applies to actually developing and deploying a nuclear warhead for a given missile.” However, Iranian officials have insisted that the country’s ballistic missile program is for defensive purposes only, and doesn't fall afoul of restrictions imposed by the U.N. or other bodies. Iran’s interest in developing ballistic missiles as the third component of an effective nuclear weapons capability can be traced back to the 1960s and can be tied to its regional security interests even before the Islamic Revolution in 1979. In general, the U.S. intelligence community has publicly stated that it believes Iran’s overall approach to its international affairs “will remain relatively constant and will continue to be driven by longstanding priorities of preserving the Islamic regime, safeguarding Iran’s sovereignty, defending its nuclear ambitions, and expanding its influence in the region and the Islamic world.” Similarly, the Defense Intelligence Agency (DIA) stated the strategic objectives of Iran’s leadership are “first and foremost, regime survival; making Iran the preeminent regional power; and turning Iran into an economic, scientific, and technological powerhouse. Since 1999, the U.S Intelligence Community has assessed that Iran could test an ICBM capable of striking parts of the United States by 2015 with sufficient foreign assistance, no doubt assessment has hit the near to a bull's eyes with the Iranian's test of Emad in October 2015. However, there is no reliable open-source assessment as to how much Iran spends to develop, test, and field its ballistic missile capabilities, nor how much it spends relative to other nations that develop, test, and field ballistic missiles. There is limited open-source data, however, regarding Iran’s military expenditures in general. Over the period 1997-2009, Iran reportedly spent about $6.2 billion annually (U.S. constant dollars). Iran’s military expenditures placed it fourth among the other Gulf States and the GCC.As a function of GDP, Iran’s military expenditures placed it sixth among those same states  and 60th in the world according to the CIA. In the fall of 2013, the United States, Great Britain, France, China, Russia, and Germany (the “P5+1”) had entered into intensive negotiations with the recently elected government of Iranian President Hassan Rouhani. Those negotiations soon led to an interim agreement that froze and in some cases rolled back Iran’s nuclear program and ultimately culminated in the Joint Comprehensive Plan of Action (JCPOA) on July 14, 2015. This comprehensive agreement, when implemented, will severely constrain Iran’s nuclear program and ensure that it is intensively monitored for many years. Because the JCPOA will prevent Iran from arming its ballistic missiles with nuclear warheads, Iran’s missile inventory looks far less formidable than it would have without the agreement. Iran’s ballistic missiles armed with conventional warheads are relatively inaccurate. They can inflict pain and suffering on civilians, as happened in the “War of the Cities” during the eight-year conflict between Iraq and Iran, but they are not a game-changer militarily, nor do they constitute an existential threat to any nation. Again because of the size and capabilities of Iran’s ballistic missile force, some argue that in the event of a crisis or conflict the United States might be deterred from engaging Iran militarily or that the possibility of ballistic missile attacks might preclude certain U.S. force options. In fact, the U.S. IC believes that Iran views its missile forces “as an integral part of its strategy to deter—and if necessary retaliate against—forces in the region, including U.S. forces. Its ballistic missiles are inherently capable of delivering WMD, and, if so armed, would fit into this strategy.” In addition, some observers have argued that because many of Iran’s neighbors lack their own deterrent capabilities or effective ballistic missile defenses Iran could “blackmail such states into meeting demands, for example, to raise oil prices, cut oil production or even withhold cooperation with the U.S. on which their very survival depends”. In the event of a conflict, one expert wrote, “U.S. military action would be to forestall Iranian interference with Gulf oil exports; this would have to be near total in its effect on Iranian capabilities. This would be difficult if not impossible to achieve, leading to a fear of attack which alone would have a formidable impact on oil prices.” Iran thus is viewed as a challenge to U.S. national security interests in the region, even with superior U.S. conventional military power. A major trend in U.S. military sales to the Persian Gulf states today is for anti-missile systems intended precisely to address this threat. Finally, Iran’s ballistic missile and space launch programs are major drivers of the U.S. BMD program. In addition to an extensive number of short-range ballistic missiles (SRBMs) and a smaller number of medium-range ballistic missiles (MRBMs) in Iran, the United States remains concerned about the possibility of an intercontinental range ballistic missile (ICBM) program in Iran. Such threats in the future are the basis for the Pentagon’s plan to deploy increasingly capable phases of BMD, called the European Phased Adaptive Approach (EPAA), over the next decade in Europe and perhaps in the Persian Gulf as well. The U.S. EPAA will be integrated with other BMD systems already being developed, augmented and deployed by NATO individual member states under NATO command and control architecture.. To deploy minimum deterrent against Iran, U.S. has no much options left beside providing Russians bunch of reasons to get annoyed and pushing the latter to cut it's own deal with Iranian Government. Dennis C. Blair, Dir., National Intelligence, Annual Threat Assessment of the U.S. Intelligence Community for the Senate Select Committee on Intelligence, February 2, 2010, p. 25. Anthony H. Cordesman and Aram Nerguizian, The Gulf Military Balance in 2010: An Overview, Center for Strategic & International Studies, Washington, DC, April 2010, p. 36. Data for military expenditures was taken from the annual Military Balance, published by the International Institute for Strategic Studies (London). Ibid., Figure 24: Southern Gulf Military Expenditures by Country: 1997-2009, p. 36. Ibid., Figure 25: Comparative Military Expenditures of the Gulf Powers as a Percent of GDP – 1989-2009. See CRS Report RL34051, Long-Range Ballistic Missile Defense in Europe, by Steven A. Hildreth and Carl Ek. CRS Report R42529, NATO’s Chicago Summit, by Paul Belkin. Also, LTG Patrick J. O'Reilly, USA, BMD Overview— Phased Adaptive Approach, Missile Defense Agency, 11-MDA-6321, Washington, DC, August 15, 2011, http://www.mda.mil/global/documents/pdf/bmds_briefing12.pdf. CRS Report R42529, NATO’s Chicago Summit, by Paul Belkin.